"Mrs. Barbara Joan Miller, Mrs. Georgea Hudner, and family, Mrs. Pamela Brown Knight and Family, Governor Baker, Mayor Walsh, Secretary Spencer, General Dunford, Admiral Moran, Vice Admiral Brown, Distinguished guests Ladies and Gentlemen, For CAPT Tom Hudner, it was about family. I would like to start by taking this opportunity today to talk about my family. Help me recognize my wife Rosa and three of our four children here today - Nathan Jr., Mikaela, and Elizabeth. Rosa is the foundation of our family, and strong as steel. Together, Rosa and I owe a debt of gratitude to her mother Nila who has contributed so much to ensuring that what we continue to build together remains strong. 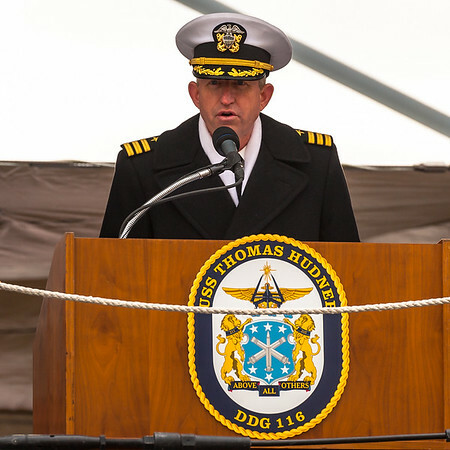 Today, we come together as a family, to celebrate our ship’s namesake, CAPT Thomas J. Hudner, Jr., who, on 04 December 1950 valiantly and intentionally crash landed his own plane to save his element leader, his friend, and his shipmate, ENS Jesse Brown. Today, we come together as a family, to honor the character of the man for whom this ship is named. It is through his character that he was able to defy what was once the core elements of a society that continually wronged people who were not like the majority they lived with. It is through his character that, upon ending 27 years of Naval service, he then served our veterans in the great city of Boston for another four decades. Today, we come together as a family, to remember CAPT Hudner for what he left behind – and continue to build a legacy of better American citizens who show more concern for their brother, sister, friend, or neighbor then the concern they have for themselves; a legacy where we understand and endeavor to better ourselves and those around us and help those soldiers, airmen, Marines, and Sailors that have gone before us to serve our great nation and put themselves in harm’s way to defend values, beliefs, and ideals for which this country stands for and for which they believed in so strongly that they risked their lives defending them. As we celebrate our ship coming to life and entering into Naval service, we endeavor as a crew to be better human beings. As we celebrate, we endeavor as a crew to serve honorably. And, as we celebrate, we look forward to the day where we might be tested and even find ourselves in a predicament, as he was, where we will do what it takes, without hesitation, despite the odds, despite the orders, despite societal barriers, to save our brothers and sisters who are themselves in harm’s way. We look forward to the day where we, too, can be like out ship’s namesake, like CAPT Hudner. Before you stand 312 of American’s finest sons and daughters from 46 different states as well as several countries around the world with over 2288 years of experience that have chosen to serve their country and continue to fight for what we believe in as a nation. I can’t begin to tell you how proud I am of this crew and what they have accomplished over the last three years watching the ship come together in Bath Iron Works, heading out to sea on sister ships for training and experience, and spending countless hours carrying out tasks required to bring this mighty warship we now call USS THOMAS HUDNER to life. Ladies and gentlemen, please give them a round of applause in recognition for their hard work, dedication, and service to this great nation. I can’t begin to tell you how grateful we are, as a crew, for how well this ship is built and for all of the support we have received to make this day happen. If CAPT Hudner were here today, I would tell him that while we can never fully live up to the standard he set in his 67 years of service to our nation and our nation’s veterans, we will embody and carry forward his legacy through his ship that now bears his name. We will honor and remember Tom by always forging our way forward helping each other out and working as a cohesive team, believing in the concept of family and taking care of each other, and always putting our shipmate’s well-being above our own. For full-size photos click here.